There are many of us who fastidiously keep household bills and bank statements and other documents which contain information about ourselves that would prove useful if they fell into the hands of an Identity fraudster. We take these documents that arrive through the post and through online mailings as part of our daily routine and sometimes fail to consider just how much damage an Identity fraudster could do to our credit ratings if they fell into their hands. Bank statements contain as much information as an Identity fraudster needs to begin draining money from our bank or building society accounts as well as making purchases without our knowledge. If you look at your bank statement - and it is surprising just how many people simply look at the balance figure at the bottom of the statement - you will find information that is ready money for any fraudster if they know how to use it. Bank statements include details of the branch where the account is held, the sort code, the account number and also your name and address. In some instances if a person is sharing the account jointly with another then their name will be displayed on the statement as well. Credit card statements are another excellent source of information for an Identity thief. This document will provide them with information on the sort of purchases you make, where you make them from and also the nature of your credit card account and how much money you have left available to spend. When you receive such documents through the post it is important that they are stored in a safe place where they can be easily called upon but safe enough so that they are unobtainable to anyone who should not have access to them. One of the safest ways to store such documents is a small filing cabinet. These can be bought easily and are relatively inexpensive. Most filing cabinets produced now are fireproof so this is an added bonus. If you do choose to purchase a filing cabinet you will receive two keys with it. Keep these keys in a safe place where perhaps only you and your partner will know where to locate them. Small safes that can be kept in cupboards are also a reliable way of storing documentation. Again these safes are fireproof and are also very difficult to get open if stolen. Most are now fitted with digital locking systems where a numeric code is required to open them. If you purchase such a safe then you should choose a code that is easily remembered but difficult for others to figure out. Avoid using birthdays or years of anniversaries as numeric codes - these are easier to crack than you might think. If you have finished with documents and no longer feel there is reason to keep them do not simply tear them up. An identity thief can remove paperwork from outside bins and reconstitute them and will be able to retrieve details from them with relative ease. 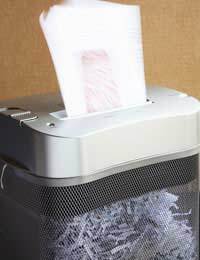 A small desktop shredder can be purchased from most high street retailers and offers additional peace of mind in that the documents are shredded into very fine strips thus making it difficult if not impossible to retrieve information from them. Many people simply glance at literature coming through the letterbox and once they have established it is junk mail they simply consign it to the waste bin. If you are receiving junk mail that is specifically addressed to you then it is worthwhile removing any labels or parts of the document that contains your name and address. The same principle can be applied to envelopes as to junk mail. When you have removed the contents of an envelope remove the address label from the front of the envelope or shred it to make the name and address unreadable. Following these steps may not rule out the chances of an identity thief sifting through your rubbish for details of your name and so forth but it will certainly make the process more laborious and much less likely to succeed.